Alcohol licensing hours in Thailand can be confusing for some tourists. Actually, to be honest, it is confusing to me at times. The hours that you can and cannot buy alcohol at your local convenience store or supermarket just don’t make sense. In Thailand, you can only buy or be served alcohol between the hours of 11 a.m. – 2 p.m. and 5 p.m. – midnight. 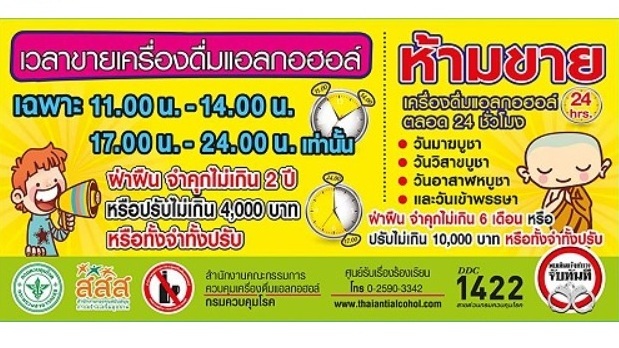 Of course, this being Thailand, your local mom and pop store will probably sell you beer outside of these hours. Though they might refuse if they don’t recognize you. After all, you could be working undercover for the police. The fine for selling alcohol outside of these hours is up to 4,000 Baht and/or up to two years in prison. In addition to these licensing hours, there are also 24 hour bans on the sale of alcohol on religious holidays such as Wan Makha Bucha, Wan Wisakha Bucha, Wan Asakha Bucha and Wan Khao Phansa. The fine for selling on these days is up to 10,000 Baht and/or up to six months in prison. But, like I said, alcohol is still being sold. Just this morning, I was buying some eggs at my local mom and pop store when a Tuk Tuk driver pulled up. He was served a shot of alcohol in a small brown bottle. On closer inspection, I could see it was one of those energy drink bottles. So, the next time your driver drinks some Krating Daeng or M-150 to keep himself awake, be aware, it might actually be a shot of whiskey he is drinking. What do you think about the licensing hours in Thailand? Do you think they are effective? If not, what should they do to solve the alcohol problem in Thailand?